Oregon is often thought of as being lush, with plenty of rain, moss, and waterfalls. But our southwest region is actually both hotter and drier than the rest of western Oregon. Precipitation here is also highly seasonal, with long dry summers, exactly when water needs for agriculture and urban users are highest. Our region has also experienced periods of drought, and very low snowfall. The combination of these factors results in low stream flows, and the need to work together to manage water in order to meet all agricultural and urban demands, along with the needs of wildlife. Improving the efficiency with which water is used will be critical to meeting the water needs of our growing population. Homeowners, urban and rural, have an important role to play in conserving water. For example, in the Medford area, water usage triples in the summer, with the primary culprit being irrigation of our landscapes. Much of this increased demand is tied to the watering of thirsty lawns. From efficient irrigation in the backyard or agricultural field, to water saving fixtures in the home, we all can make a difference. Remember – change starts with you. In their zest to create the most attractive lawn or garden in this dry environment, well-intended homeowners sometimes contribute to stream pollution by applying too much water to their yards. This extra water then runs into the street, down the storm drain, and in turn into local waterways. Irrigation runoff picks up fertilizer, pesticides, and pet waste in the landscape, and is warmed by the pavement it crosses, degrading its quality along the way. Try these tips to reduce the amount of irrigation needed and to water your landscape strategically to prevent water used on landscapes from ending up as pollution in streams. 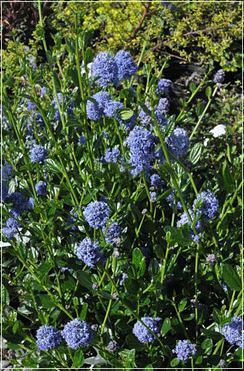 Ceanothus ‘Skylark’ is a native shrub adapted to drought conditions. Design your landscape so that plants with similar requirements for light and water are grouped together in the same location. A landscape that’s designed to save water is often referred to as “water-wise” or a “xeriscape.” These attractive landscapes rely on far less water than a traditional yard. 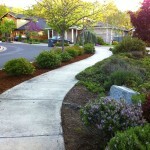 Planting a xeriscape or water-wise garden will reduce the amount of water, pesticides, or fertilizers you need to buy. These gardens are resistant to drought and disease and they also attract birds and butterflies to your yard. Start with a Plan. In the end, you will be happier with your final landscape if you identify what functions you want your landscape to accommodate. Also, evaluate your yard before you turn a shovel. How much space would you like for entertaining or for children to play? Do you need to create shade, a windbreak, or privacy screen? Are there areas in your yard that are naturally wet, dry, sunny, or shady? Additionally, a good plan will minimize water use, while adding color and interesting textures and shapes through each season. Create Practical Turf Areas. Xeriscaping does not mean that you cannot have any lawn in your yard, but the lawn you have is typically smaller and located where the family can best enjoy and use it. Group Similar Plants. This includes matching the location with the mature size, shape, and sun needs of plants selected. But in a climate such as ours where minimal rain is received for long periods each summer, it should also include looking for plants that are less thirsty in the summer. Some plants are so drought-tolerant that they only need winter rains to be happy and no irrigation at all during summer. Cold-tolerant varieties, native to the Pacific Northwest, are good choices. If you have some thirstier plants that you just can’t turn your back on, include a limited number in a focal location you can enjoy. By grouping them together and placing them in a separate irrigation zone, you’ll also be able to meet their higher water needs without over watering the rest of your landscape. Improve the Soil. Good quality soil will both absorb water well and retain moisture for plants to use between rain events or sprinkling. When you dig in, make sure you can break up the soil easily. This is a sign that water can penetrate into the soil with no trouble. In many parts of the Rogue Valley, soils are either heavy in clay, absorbing water slowly, or are granitic, and don’t retain water well. Adding organic amendments, such as composted manure and general mixed compost, can make a big difference in improving absorption and keeping the soil loose. Mulch. Mulch helps hold moisture in the soil, and prevents weeds and erosion. Put 2-4 inches of mulch on the soil, keeping it away from plant stems. Mulches can include shredded bark, shredded yard clippings, or bark chips. Efficient Irrigation. Select an appropriate irrigation system and schedule. Water early in the morning when temperatures are lowest. Maintain the Landscape. From seasonal adjustments of sprinkling times to replacing mulch when needed, your landscape will benefit from regular upkeep. Routine maintenance of your landscape and its sprinkler system will also keep your yard looking at its best. Consider an evaluation of your irrigation system to make sure your sprinklers are functioning properly and you are using the amount of water your lawn and garden requires. Some local water providers offer these evaluations as a free service. Otherwise, check with licensed landscape contractors to make sure your irrigation system is tuned up and that sprinklers are not clogged or broken. Make sure that you are not watering concrete or gravel sidewalks, paths, or driveways. Small adjustments like this can reduce a lot of water wasted due to overspray and runoff. It will also save money on your water bill. Without proper scheduling and maintenance, automatic sprinkler systems can over-water by 50% or more. Perform occasional irrigation system tune-ups throughout each growing season, to assure that sprinklers are operating correctly. In some cases, renovation of sprinkler systems might be needed. This will greatly improve water coverage, which will result in better plant growth and water savings. Timing is everything! Up to 30% of your irrigation water may be lost through evaporation before it ever reaches plants if you water during the hottest parts of the day (including the evening). Water only between sunset and sunrise, when temperatures and wind speeds are lowest. Ashland’s Watering Hotline: 541-552-2057Adjust sprinkling to match changing weather. For example, the amount of irrigation needed by lawns ranges from zero when we get spring showers, to nearly 2 inches a week during limited, very hot periods. The City of Ashland and Medford Water Commission provide updated home irrigation recommendations based on current weather. Water grass more deeply but less often for deeper, stronger, and healthier roots. To achieve this with less runoff and more infiltration, water in short cycles spaced only a few hours apart, rather than single long watering cycles. In a drought, consider watering lawn only about 25% of normal. It will show modest browning, but should come back when fall rains arrive. A good irrigation design will apply water evenly, and meet the water needs of the landscape with components that match the size, shape, and plants being watered. For shrub areas, consider drip irrigation. 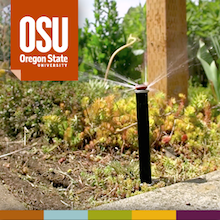 With drip irrigation, water is delivered to plants’ roots, right where it is needed. Additionally, because only areas with plants receive water and very little moisture is lost to evaporation, it is an effective way to meet water needs using much less water. These systems can adapt to what you are growing and expand with your garden through adding and changing the size of emitters utilized. Save water and reduce stormwater flows by catching rain for later use during the summer. Instead of letting your downspouts drain off your property, consider directing downspouts out into the lawn or garden. You can also re-direct downspouts to attractive rain gardens or install a large cistern to hold your runoff. 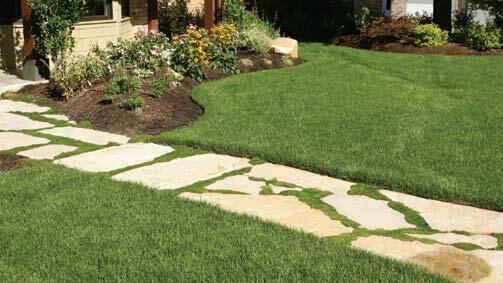 Permeable pathways allow the water to sink into the ground better than traditional hard surfaces. Get Conservative with Water in Your Landscape! Visit the following website links to access detailed information on irrigating and water-wise gardening, including several sources tailored to the Rogue Valley. 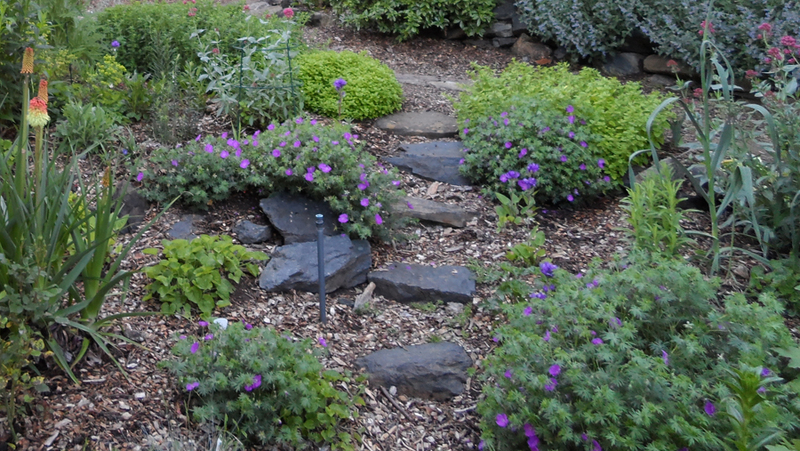 Water-Wise Landscaping in the Rogue Valley – an extensive plant database with information on soils, water needs, sizes, colors, sun needs, and blooming seasons for a wide range of plants. It has hundreds of photos providing examples of attractive local landscapes using water wise principles and links to more web sites. Landscape Sprinkler Design – provides tips for property owners considering installation or modification of an irrigation system. Sample Lawn Watering Schedule – approximate watering schedules for our local area. 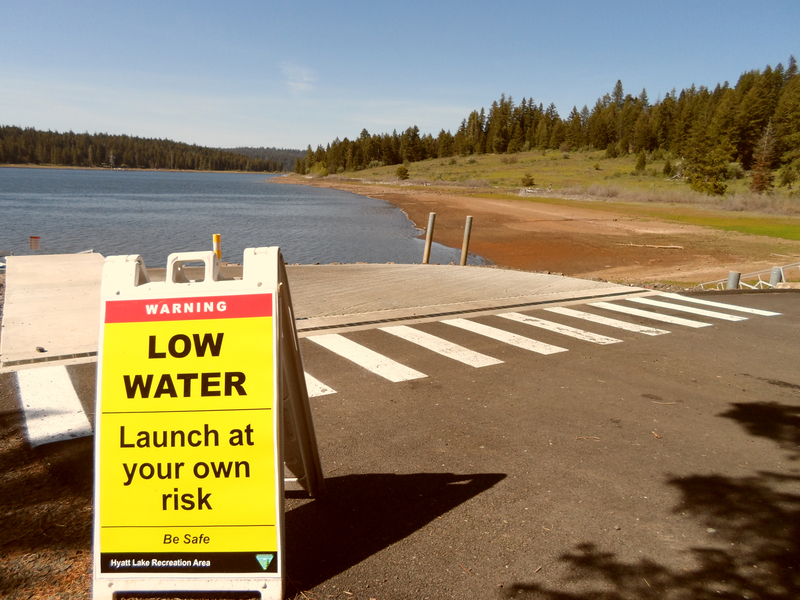 The City of Ashland’s website includes water conservation information. They also have an extensive plant database, and hundreds of pictures and links to additional websites, like This Waterwise Landscaping feature. Drought Tolerant Plants for Oregon’s Rogue Valley, which includes tips and a plant list from Shooting Star Nursery. Urban Living handbook 7 Tips for Xeriscape and Water conservation in Your Home.